Fernando Trevino Jr. is currently a Freshman Business major at the Mays School of Business at Texas A&M University. He was born in Del Rio, Texas and later moved to Brownsville, Texas. Fernando's interest in politics and public service began very early in life but was not fully realized until the 2008 Democratic Presidential primary. Before this time, he considered himself a "liberal" Democrat, but then-Senator Barack Obama awakened his inner conservatism. It was at this point that Fernando Trevino realized the correlations between Latino beliefs and the principles of conservatism and the Republican Party. Fernando Trevino Jr. began his involvement as a Congressional Intern at the district office of US Congressman Solomon P. Ortiz. After leaving the office, Fernando co-founded a Republican club at his high school and a political blog: Write for the Right. He then went on to co-organize an April 15th TEA Party Protest in Brownsville, Texas. Since this time Fernando Trevino Jr. has been on talk radio shows in the Rio Grande Valley, and "Canto Talk" on BlogTalk Radio. Fernando is currently serving as a volunteer for Mr. Francisco "Quico" Canseco's 2010 Congressional Campaign and as Campaigns Director for the Young Conservatives of Texas at A&M. 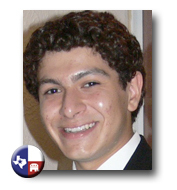 Fernando Trevino blogs for TexasGOPVote. You can read his blogs here. You can also follow Fernando on Twitter.